Pompey’s Piller is the biggest memorial column of red granite in Egypt. It is a 30m Roman triumphal column in a rocky hilltop in the middle of Alexandria. It is about 28 m high and has been one of the city’s prime sights. 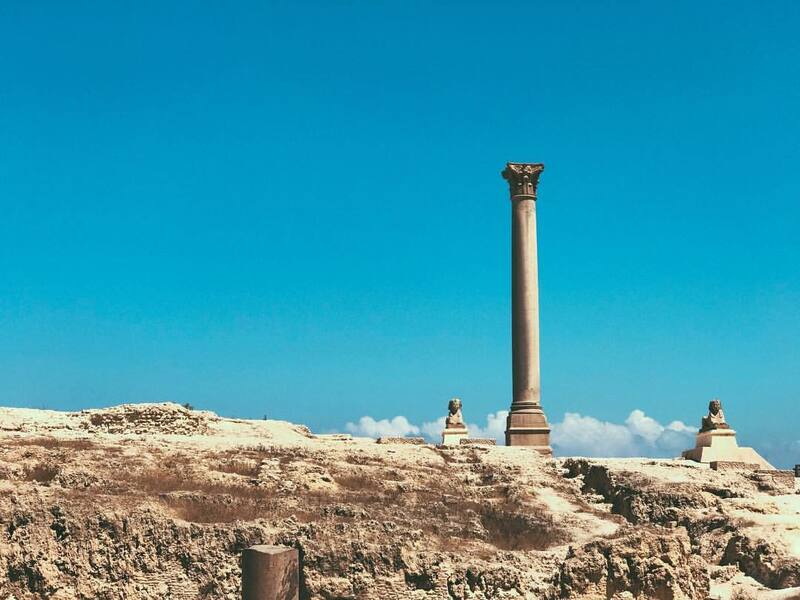 This column was chosen by the Roman ruler of Egypt to be a gratitude sign of the Roman emperor Diocletian between ( 284 and 305A.D) and has nothing to do with the Roman Consul and General Gaius Pompey, who was killed by Cleopatra’s brother. In the first centuries A.D, Christianity was the main religion in Egypt and that’s why the pagan gods were neglected. The Serapeum was dedicated to Alexandria’s patron god, Serapis. It conflicted a lot with the Christian thoughts and in 391 A.D, the leader of the church in Alexandria, patriarch Theophilus, ordered to destroy the serapeum and all the remaining symbols of paganism. The column today marks what was once a huge temple, which was constructed with precious metal on the interior. There are some remaining tunnels around the complex open for tourists to discover during their Egypt tours packages. The site includes trenches and holes, with a couple of narrow shafts from the Serapeum to explore below. There are a few sphinxes (Originally from Heliopolis) and a surviving Nilometer (a structure used to measure the level of the Nile in ancient times. The weight of the single red granite stone is about 285 tonnes. The column measures 20.46 m in height with a diameter of 2.71 m at its base. There are the remains of a Serapium on the backside of the pillar that is really damaged. This construction was built during the reigns of Ptolemy II and Ptolemy III. It was actually damaged because of the revolts of the Jewish population in Alexandria. It was rebuilt during the reign of Hadrian but was destroyed once more after the spread of Christianity. There was a basin at the side of the platform that was used for the purification process. There are also 2 galleries at the back of the temple. The first gallery contained a black statue of basalt from the reign of Hadrian. This statue represents the god Serapis in a shape of a bull. It was taken to the Museum in Alexandria. The second gallery is known as “The Daughter Library” but it was actually an Anubidiun (the burial for the mummies of Anubis), who was a member of the Pantheon of Alexandria.